Note 1: Like Nekketsu games? Check out all my other Nekketsu reviews (plus Super Dodge Ball)! Note 2: This game was played on a NES model 101 Toploader that has been modified to output in AV (red, white, yellow) just like the original NES. The NES was hooked up to a 32 inch HD tv. 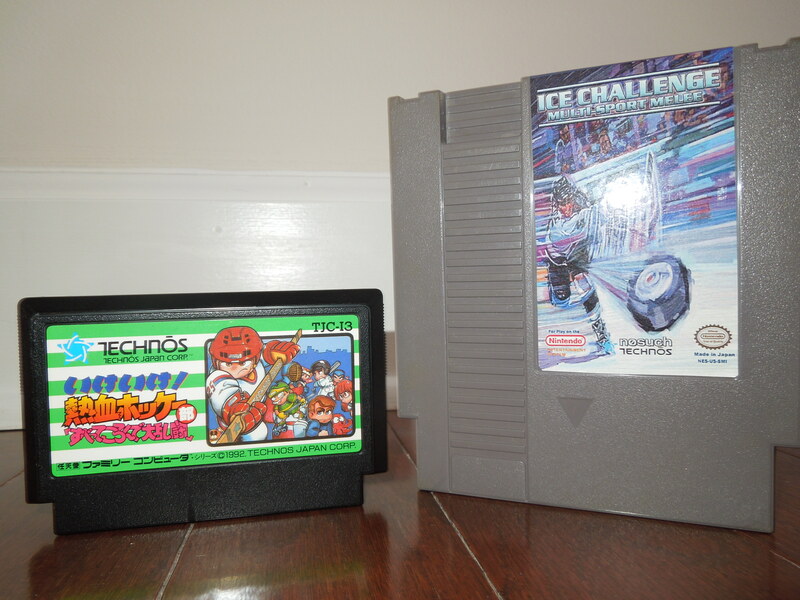 Quick History: Ice Challenge: Multi-Sport Melee is an ice hockey game that was released for the Famicom (Japanese NES) under the title, Ike! Ike! 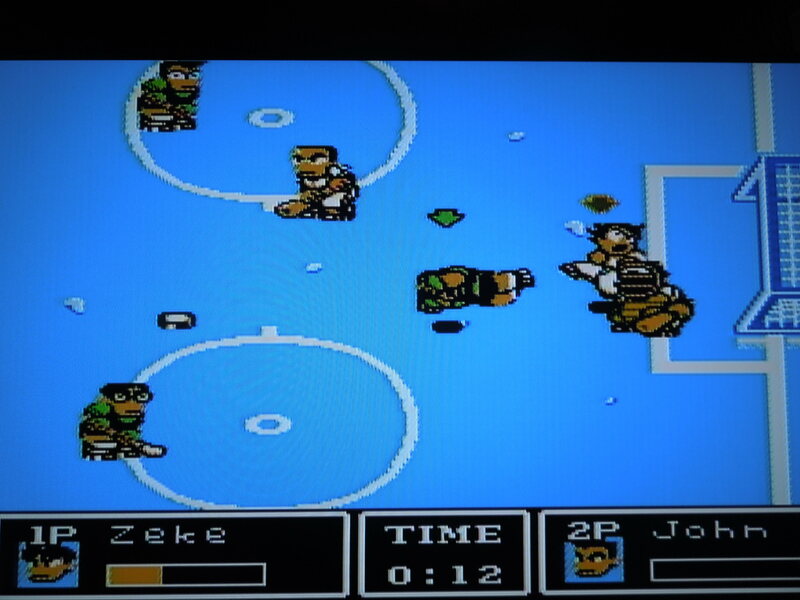 Nekketsu Hockey Bu in 1992. Sadly, the game was never released in North America. Evidently, there was a plan to release the game under the title, Crash and the Boys: Ice Challenge, but the game was cancelled, possibly due to a fear that it wouldn’t sell well. 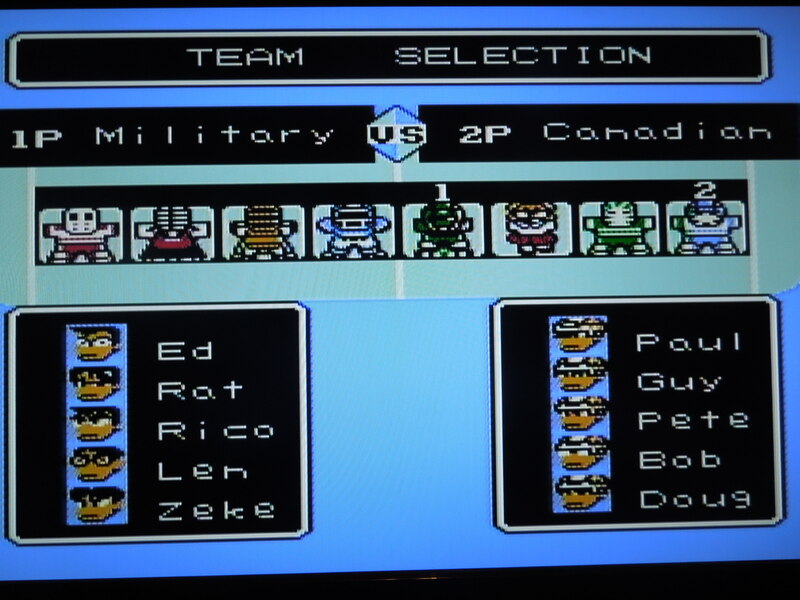 The game is a part of the Kunio-kun series of video games, some of which were released in North America, such as the original Crash and the Boys (Sporting Events), Nintendo World Cup, and Super Dodge Ball for the NES. All of these games use similiar sprites for the characters, and have a distinct feel to them. Today, the rom of Ike! Ike! 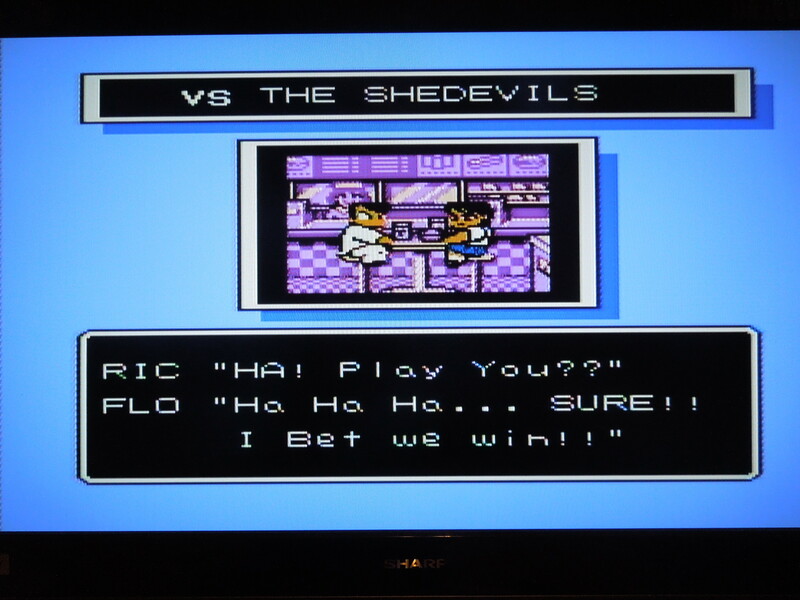 Nekketsu Hockey Bu has been translated into English (the main parts in Japanese were player names and the occasional dialogue cutscene) and placed onto an NES cartridge for play on your original Nintendo Enterntainment System! That is the game I am reviewing – the translated reproduction. The Multi-Sport Melee portion of the title refers to the fact that you, as a hockey team, compete against other sports teams from your school who think they have what it takes to best you at your own sport. Gameplay: Ice Challenge has, essentially, 2 modes of play. Story mode and VS. Mode. Story Mode is avaliable for 1 player or for 2 player co-op. In Story Mode, you, as Ric (Kunio) set out to challenge all opposition at your high school in hockey matches. You will face a total of 10 teams, with each team getting progressively more difficult as you advance. *Note – there are very, very detailed FAQs online that provide statistics on these teams. Each game consists of three 3 minute periods, with a 30 second (skippable by pressing START) intermission after the 2nd period for the referee to sweep the ice. Beginning with the second team you beat, the Samurais (Kendo team), you will receive a 4 digit password that allows you to start back where you left off, should you choose to end the game. Quitehandy. After you beat a team, you can then wear their uniforms, which helps strengthen your team. You are allowed to choose who will play during each game, with some players having stronger attributes than others (Speed, Power, Defense – these all have a high or low number). While the game starts off easily enough, it quickly gets challenging. In addition to wearing the uniforms of teams you defeat, you also get new players who join your team at certain points, all of whom have greater Power, Speed, or Defense than your previous players. Your hockey team consists of 4 players, including the goalie. You control the player nearest the puck, so when you pass to a teammate and he receives the puck, you then control that character. When your opponent shoots on your goal, your control switches to the goalie, and you’re able to move up and down or forward and back (a bit), in addition to blocking a high shot or low shot by hitting A or B. 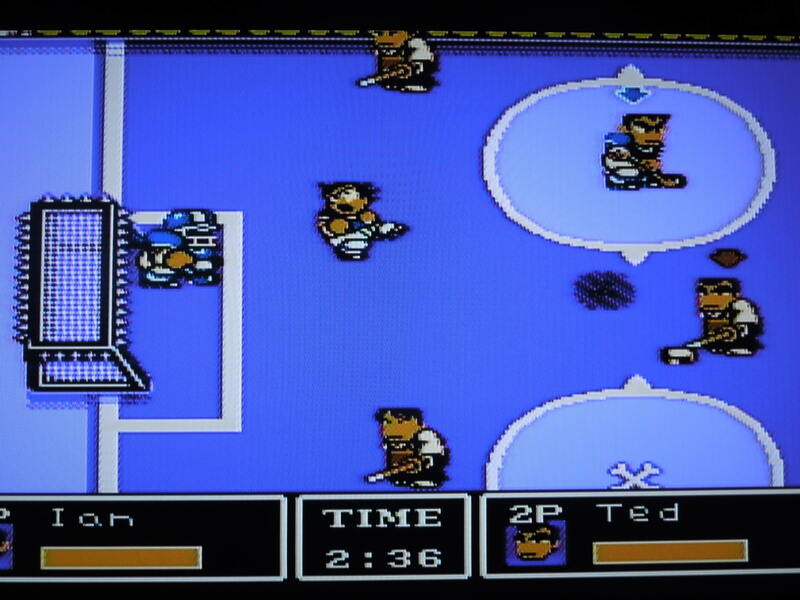 In 2 player co-op, Player 1 controls the 3 skaters, and Player 2 controls the goalie. As a skater, the A button, firmly tapped, executes a pass to your teammate. Held for longer, the A button executes an air pass, and a quick tap spins the puck in the air in front of your skater for a shot with the B button. Holding the B button for a few seconds allows your player to execute his or her special shot, which has a greater chance of scoring a goal (your character’s ‘power bar’ decreases as you hold B). On defense, A executes an attack with your stick, while B executes a shoulder tackle. Hiting A + B allows your player to jump, with an additonal press of B executing an air attack, like a dropkick. Pressing a quick toward, toward moves your skater quickly across the ice. It all sounds a little complex, but it takes you all of 1 period of play to pick the game up. Simple, actually. The controls are spot on and tight. 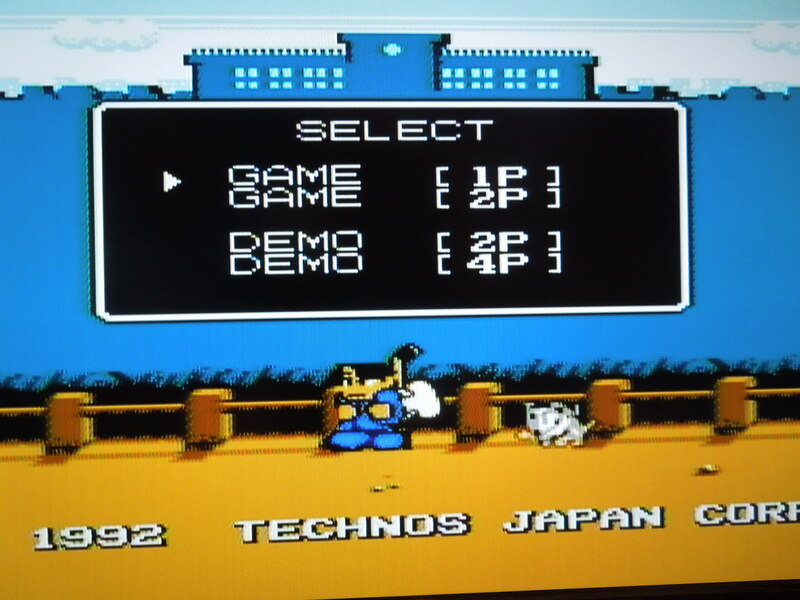 The second mode of play is VS (called 2P Demo in the actual game). In this mode, each player can pick among any of the avaliable teams for a match. This mode is great because it allows you to pick among 5 different hockey rinks, some of which have crazy features such as hidden bombs under the ice or ‘bumper’ walls that send you flying when you hit them. Sound and Music: Wonderful sound effects from the sound of a stick whacking another player to the whistle blowing for when a goal is scored. The music is incredible as well. Different songs play for different teams you face, and some you’ll find yourself humming later. Graphics: Some of the best I’ve seen on the NES. No flickering or flashing sprites. Everything is smooth. The characters are large and detailed, with each skater having their own unique facial features. 4 player game? You may notice on the opening screen that the game appears to accomodate a 4 player mode. This may be so if you have the original Japanese release and a Japanese Famicom with a 4 player adapter. However, on my translation reproduction NES cartridge, even with a 4 player adapter (NES Fours Score), this option is not avaliable. I’m unsure as to why it won’t work, but you can only play with 1 or 2 players on this version. Some of the rinks have surprises, like explosive mines, waiting on you. Penalty Box? Get roughed up too much, and your character will get angry (you’ll notice their face will look different than usual), and you’ll be able to throw a massive punch that gets you sent to the penalty area until the next goal is scored. The computer players are notorious for getting temporarily ejected, so use this to your advantage when they’re a man or two down. Where can I find this game? You can find cheap copies of the orignal Famicom release, Ike! Ike! Nekketsu Hockey Bu on ebay. You’ll need either a Famicom to play it on or a ‘Famicom to NES’ converter for play on your NES. There are also websites that sell the translated version on a NES cartridge. Google ‘NES reproductions’ or something similiar. Conclusion: This is not only one of the best hockey games, but one of the best sports games I’ve ever played. It’s right up there with NES classics like Tecmo Bowl. It’s addictive, easy to look at, and great fun to play. The ONLY negative I’ve found about this game is the lack of Overtime after the 3 periods end, even if there’s a tie. There’s nothing more discouraging than battling your tail off against the Canadians, tying up the game 9-9 with :02 left on the clock, and then still losing because ties count as losses. An addition of Sudden Death would have made this the perfect game. But alas, one can’t have it all. This is, nonetheless, a sports game I’ve come back to again and again, and it’s most fun with 2 player, either in co-op or VS.
Cutscenes play in between matches in Story Mode, setting up Ric’s hockey team vs a new challenger.